Since the publication in 1859 of Darwin’s Origin of Species, debate over the theory of evolution has been continuous and often impassioned. In recent years, opponents of "Darwin’s dangerous idea" have mounted history’s most sophisticated and generously funded attack, claiming that evolution is "a theory in crisis." Ironically, these claims are being made at a time when the explosion of information from genome projects has revealed the most compelling and overwhelming evidence of evolution ever discovered. Much of the latest evidence of human evolution comes not from our genes, but from so-called "junk DNA," leftover relics of our evolutionary history that make up the vast majority of our DNA. 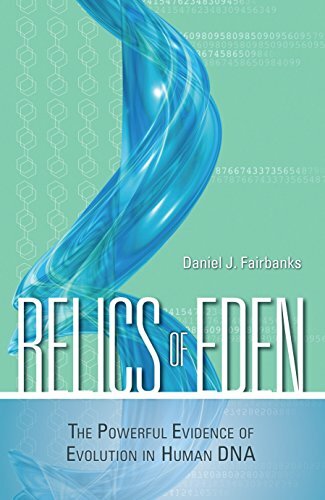 Relics of Eden explores this powerful DNA-based evidence of human evolution. The "relics" are the millions of functionally useless but scientifically informative remnants of our evolutionary ancestry trapped in the DNA of every person on the planet. For example, the analysis of the chimpanzee and Rhesus monkey genomes shows indisputable evidence of the human evolutionary relationship with other primates. Over 95 percent of our genome is identical with that of chimpanzees and we also have a good deal in common with other animal species. Author Daniel J. Fairbanks also discusses what DNA analysis reveals about where humans originated. The diversity of DNA sequences repeatedly confirms the archeological evidence that humans originated in sub-Saharan Africa (the "Eden" of the title) and from there migrated through the Middle East and Asia to Europe, Australia, and the Americas. In conclusion, Fairbanks confronts the supposed dichotomy between evolution and religion, arguing that both science and religion are complementary ways to seek truth. He appeals to the vast majority of Americans who hold religious convictions not to be fooled by the pseudoscience of Creationists and Intelligent Design advocates and to abandon the false dichotomy between religion and real science. This concise, very readable presentation of recent genetic research is completely accessible to the nonspecialist and makes for enlightening and fascinating reading. If you have any questions about this product by Prometheus Books, contact us by completing and submitting the form below. If you are looking for a specif part number, please include it with your message.